Eastern Acoustic Works (EAW) has hired Gino Pellicano, Dave Salmon, Peter Maguire, and Jonas Domkus to bolster the company's customer support infrastructure. 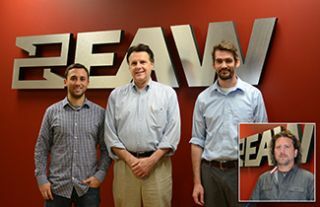 Pellicano and Salmon join the EAW application support group as application support specialist and application support coordinator respectively. Maguire has been named customer support manager while Domkus takes on the role of U.S. field application engineer. Eastern Acoustic Works (EAW) has hired Gino Pellicano, Dave Salmon, Peter Maguire, and Jonas Domkus to bolster the company's customer support infrastructure. "We are experiencing a constant demand for products and support," explained EAW vice president of sales Rusty Waite. "This expansion guarantees that our customers have the best possible experience with EAW products." Prior to joining EAW, Pellicano worked at SIA Acoustics, Technomedia Solutions, and Acoustic Dimensions. He has provided acoustical and technical system design for a variety of projects including performing arts spaces, recording facilities, sports venues, and houses of worship. His significant experience in consulting, engineering and project management makes him a valued addition to the ASG team. Experienced in both the manufacturing and consulting worlds, Salmon has been involved with the design of loudspeakers themselves, as well as audio-visual systems for performance spaces, houses of worship, and higher education facilities. His time spent as a consultant for Convergent Technology Design Group and Harris Miller Miller & Hanson Inc., and also as an acoustic engineering technician for Polk Audio, has given him hands-on experience that will be invaluable to EAW customers. "We are thrilled to welcome Gino and Dave to the team," added Adam Shulman, EAW ASG manager. "With their significant combined experience in not only consulting and design but also manufacturing and system integration, we are able to further enhance our international application support team and accommodate the increased demand we're seeing. This is a very exciting time for ASG and EAW in general." Before joining EAW as customer support manager, Maguire worked at Bose where he held a number of positions including service technical advisor, technical services manager and service operations manager. In his new role at EAW he will focus on enhancing the department's processes and improving EAW's customer support experience. As field application engineer, Domkus is tasked with being the primary technical point of contact between the company, its customers, sales and engineering. His 20 years of hands-on work in supporting consultants and dealers with system commissioning, designs, and troubleshooting has provided him with the expertise necessary to enhance the EAW customer experience. "We are experiencing continuously increasing demand for our products and associated support," explained Waite. "This significant expansion of resources guarantees that our growing customer base will always have spectacular experiences with EAW products."